It's a film Nanni Moretti shook his head to in disapproval in his 1993 Dear Diary, wondering to himself how those who made it could sleep at night. It's a film that sat on the shelf for four years while the MPAA took issue with its violent content. It's a film that was banned outright from a cinema release in New Zealand. It's a film that the BBFC insisted by cut for a UK cinema release, and it was to be another 18 years before it would be passed uncut. It was shot on 16mm for a budget of just $110,000 and launched the acting career of Michael Rooker and established director John McNaughton as a talent to be reckoned with. The film, of course, was Henry: Portrait of a Serial Killer, a film that brought a disturbing and gritty realism to the crime-horror genre. Henry is the account of a man whose vocation is murder. Michael Rooker stars as Henry, the solitary drifter who leads his dim ex-jailmate friend, Otis (Tom Towles), on a senseless killing spree. Picking their victims at random, their methods of execution are always different. Otis' sister Becky (Tracy Arnold) goes to Chicago to visit, and unsuspectingly falls in love with Henry. The film is based on the crimes of real-life serial killer Henry Lee Lucas. 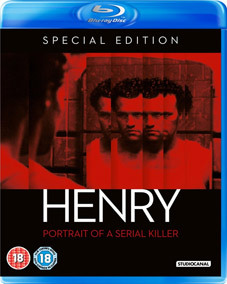 Now Henry: Portrait of a Serial Killer is getting a double-play release, containing both DVD and (for the first time) Blu-ray versions of the film, from Studio Canal on 24th October 2011 at the RRP of £22.99.